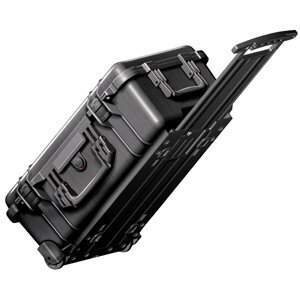 This Pelican case is also great for travel. 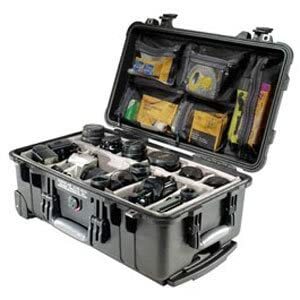 Like it's smaller sister cases, the Pelican 1650 case is perfect for transporting your camera equipment. It's retractable handle and rugged wheels make it easy to move around all your gear effortlessly. The size is good if you have a large selection of gear and need to keep it at your side. Here are this cases internal dimensions: 28.50" x 17.37" x 10.50"
It comes with foam they call pick and pluck to customize the interior. This keeps your specific items snug and safe. Again like the smaller cases, these cases are constructed from high impact Copolymer for amazing protection. They are water tight and dust proof with an o-ring seal. They also come with a built in purge valve for fast pressure equalization for altitude or temperature changes. The pelican 1650 should hold most of your equipment with a piece of mind that everything is more than protected. For more information on the Pelican 1650 click here. I recently went on a trip and wanted the ability to carry my equipment with me. After some research I decided to go with the pelican 1510 hard case because of great reviews. It also meets FAA requirements for carry on luggage. Plus it has wheels and retractable handle and rolls like my luggage which is a very nice feature. The size is perfect for a good selection of gear. Here are the Interior Dimensions: 19.75" x 11.00" x 7.60" It comes with foam you can cut to your desired size. However, the 1514 comes with adjustable dividers if you'd prefer that setup. These cases are constructed from High Impact Copolymer for ultra protection. They are water tight and airtight with an o-ring seal. They also come with a built in purge valve for fast pressure equalization for altitude or temperature changes. The pelican 1510 was an amazing selection and I fully recommend this case for traveling or just added protection with everyday use. For more information on the Pelican 1510 click here. Or if you like the adjustable dividers instead of foam the click here to info on the Pelican 1514.